新刊登物品 Trend Micro Maximum Security 12 2018 3 Year 5 Devices ---- 100% GENUINE.. Trend Micro Maximum Security 12 2018 3 Year 5 Devices ---- 100% GENUINE.. Trend Micro Maximum Security 3 DEVICE 3 YEAR GLOBAL CODE 2019 E-MAIL ONLY NO CD! Trend Micro Maximum Security 5 DEVICE 3 YEAR GLOBAL CODE 2019 E-MAIL ONLY NO CD! Trend Micro Maximum Security 3 DEVICE 2 YEAR GLOBAL CODE 2019 E-MAIL ONLY NO CD! 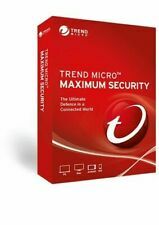 Trend Micro Maximum Security 5 DEVICE 1 YEAR GLOBAL CODE 2019 E-MAIL ONLY NO CD!